Although his journey to becoming a top podcaster was almost entirely accidental, Srinivas Rao leveraged his talent for being insanely interested in people to become one of the true innovators of this rapidly exploding medium. As the host of Unmistakable Creative regularly showcases the world’s most creative people, getting them to reveal some of their most powerful and compelling stories about how them got to where they are and became who they are. 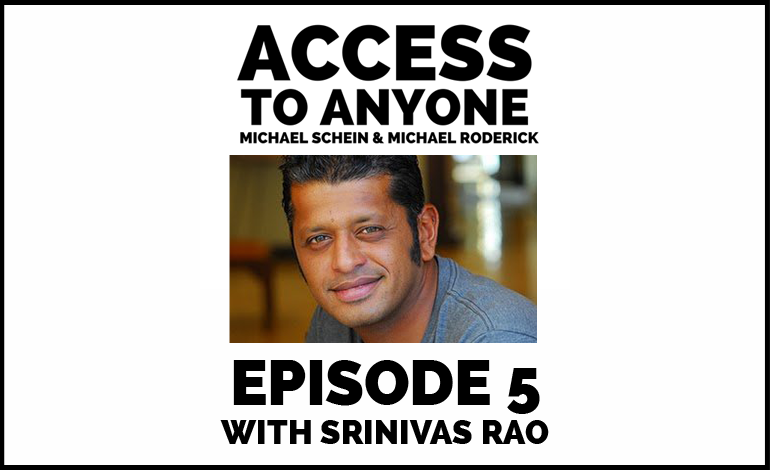 In today’s episode, we get Srinivas to open up about how you can use peoples’ fascination with genuine experiences to form relationships with connecting influential people. Why becoming attached to the process rather than the outcome will result in fewer disappointments. How to initiate content trends rather than simply following them. A one-of-a-kind approach to building ironclad relationships. Depth versus reach: which one is more impactful? Surfing the waves vs. surfing the web. Srinivas Rao is CEO of Unmistakable Media and the host of the Unmistakable Creative podcast, which began as BlogcastFM in 2010. He has interviewed over 400 creative entrepreneurs and insanely interesting people. His guests have included ex-cons, happiness researchers, world famous cartoonists and entrepreneur, to name a few. Scott Adams, Seth Godin, Tim Ferriss, Shawn Achor and Danielle Laporte are just a few of the people Srinivas has counted as guests and now counts as friends. Srinivas is also the creator of an annual TED-like conference called The Instigator Experience, where he brings together his best podcast guests for a 2-day live event. In 2013, his self published The Art of Being Unmistakable became a Wall Street Journal and Amazon Bestseller.